GOD REIGN PUBLISHING HOME..INSPIRATIONAL CHURCH. | BOOKS |. POETRY. | .ART. |..MUSIC. |..The.WORD ..|..NEW WORLD MED .| ZINES..
/"SAVING THE SOUL OF A NATION"
AND IN THE POLLS OF A NATION. to Rest for a Light of the people. lift up a standard to the people. And The Corrosion of our Individual Rights Laws. "Surrender The Battle To The Gate "
PRAYER FOR UNITY & PEACE"
"THE MILLENNIUM: TWENTY A.D "
TOP OF PAGE "HAPPY NEW MILLENNIUM,"
"REDRESSING THE STATE OF DISUNION "
NEWS RELEASE: "FREE TO CHOOSE FREEDOM "
"ELIAN AND A FATHER'S RIGHT TO CHOOSE "
"MAKING A CHOICE WITH TRUTH "
" PEACE IN OUR ABSOLUTES & BEYOND"
/ "MOTHERS' MARCH TO FREEDOM"
COMBAT RAGE & VIOLENCE IN OUR SCHOOLS! TO THE FORMER PRESIDENT OF THE UNITED STATES OF AMERICA. "THE LAND OF MILK AND HONEY "
" AMERICANS NARROWING SUPPORT FOR ABORTION "
" THE CONSCIENCE, SLICKED AND PRICKED "
A POEM FOR MARTIN LUTHER KING. CAMPAIGNS 1789 TO 2000 "
"PURPOSEFUL QUOTATIONS, THEN AND NOW." Know What The Founding Fathers Really Said. "RISE UP, AMERICA, FOR LIFE "
"CAN YOU WALK THE TALK?" "WHAT REAL PEOPLE HAVE TO SAY "
"THE POTENTIAL AND BENEFITS OF ORDER"
Now, where the Spirit of The LORD IS, there Is Liberty.
" GLORY TO GOD "
MEMORIAL SERVICE FOR THE VICTIMS OF THE SEPT. 11, 2001 TRAGEDY. "A TIME TO MEND", "DESTRUCTION AND DISTRACTION"
claiming our children and our nations. Freely by Almighty GOD, to stop oppression in your own life, family and community. Gen. / Secretary Colin Powell, When Chairman of The Alliance For Youth:"We're on the march. ..It's a Crusade! ... We need to stop building jails and get to the task of building our kids." President George W. Bush, as Presidential Candidate: "Our children are the face of our future. ...The strength of our society is measured by the values that our citizens share." Steve Forbes, Businessman "Abortions are a moral wrong and a national tragedy. ... I believe that we as human beings are Made in the Image of GOD. " Gerry M. Kaye, Pastoral Author: "All people, given Knowledge of the Truth and unity in their ONE GOD, Creator and Eternal Father, can reap of the Sanctification of belief for the Power of faith from His Benevolence. This is Promised in His Faithful Word, to lead to the rightful Heritage of the Salvation of unity and lasting prosperous peace; that in Truth: Is GOD's Will and Purpose for all, in all nations and generations." the Glory of The LORD,as the waters cover the sea. 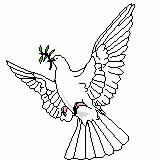 For Victory In Unity And Peace. This web site has EXCERPTS only. For THE PUBLISHER'S SPECIAL OFFER, Place An Order. Web site designed and edited by Gerry M. Kaye. "SAVING THE SOUL OF A NATION" (c) copyright 1999, 2000 by Gerry M. Kaye. All rights reserved.